US President Barack Obama and his wife Michelle will to be showered with specially commissioned gifts, when they both arrive at the President’s ancestral home in Moneygall, on the Tipperary/Offaly border, by Marine One helicopter tomorrow. The US President and America’s first lady, who will first arrive on the tarmac of Dublin Airport tomorrow morning on Air Force One, will travel by helicopter to Offaly, for a short 30 minute visit, before returning to Dublin, for a major public address at College Green later in the evening. One of the gifts specially commissioned for the US President’s visit, made by calligrapher and historian Tim O’Neill, is an ancient styled calligraphic monastic vellum scroll, scribed in both Irish and English, and including the County Offaly Coat of Arms. For First Lady Michelle Obama, there will be a gift of a flower pendant depicting an Offaly flower, the Andromeda, more commonly known as Bog Rosemary, latter designed by Rachel McKenna and made by jeweller Cathal Barber. The Obamas will also receive a traditional music CD, together with a book on the history of the thatched house in rural Ireland. 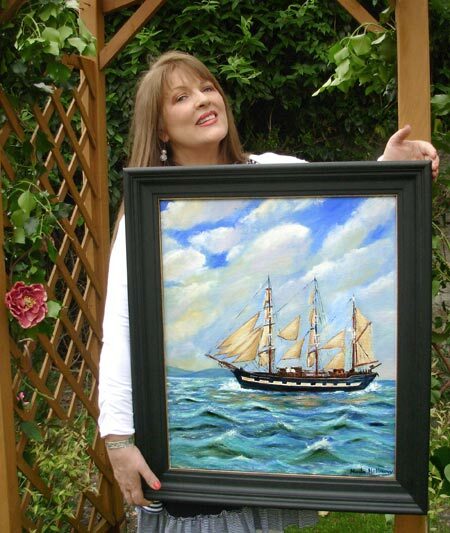 One of the more unique gifts to the US President in Dublin, however will be a painting of the famine ship ‘Jeanie Johnston,’ (Oil on Canvas) by noted Irish artist, former Miss Ireland, actress, and academic, Nuala Holloway. (Click on image above to view larger picture.) Nuala, whose third public exhibition of paintings entitled “Moments,” is due to take place in the Sol Art Gallery, Dawson St. Dublin, from December 2nd to 9th, 2011, presently resides in Dublin, while retaining strong connections with Thurles in Co Tipperary and Moate in Co. Westmeath. It is hoped that the painting will be an everyday reminder to the President, of the difficulties experienced by his early relatives who left Ireland around the time of the ‘Great Famine,’ 1845-1849 on board similar ships, the ‘Caroline Read,’ and ‘Marmion,’ eventually arriving in New York City on the 25th of April 1849 and March 20th 1850, respectively. Interesting also to note that Falmouth Kearney (c.1830-1878) married Charlotte Holloway (c.1834-1877) – any connection between modern Irish artist and ancestor, I wonder? The original, three masted ‘Jeanie Johnston ‘ built in Quebec, Canada in 1847, was bought by Tralee, Co. Kerry-based merchants John Donovan & Sons. It was a cargo vessel trading successfully between Tralee and North America for a number of years. The trading pattern then was to bring emigrants from Ireland to North America, and then to bring back timber into Europe. The most passengers she ever carried was 254, from Tralee to Quebec on April 17, 1852, the journey taking 49 days. With Irish weather forecasters promising high winds and stormy conditions over Tipperary and Offaly, locals in the Moneygall village will be saying prayers to Saint Medard, Patron Saint of bad weather. Legend states that the saint was once sheltered from the rain himself, by a hovering eagle. The Bald Eagle, as we all know was chosen in June 20, 1782 as the emblem of the United States of American, because of its long life, great strength and majestic looks, and also because it was then believed to exist only on the continent of America.